Light Detection and Ranging (lidar) is the latest speed measuring device used in Virginia. Lidar guns, (also known as “laser guns”) are handheld laser devices that law enforcement agents point at cars to measure their speed. Lidar guns measure speed using a “time-in-flight” method. The device projects invisible, infrared laser beams at a rate of about 120 to 238 beams per second for a minimum of 0.3 seconds. The lidar device then measures the time required for each of beam to bounce back. The device then multiplies the time “in flight” by the speed of light (983,571,072 feet per second) and divides the total distance by two to produce the distance between the target and the gun. The lidar gun measures the distance of the object 120 to 238 times per second (once for every beam). Lidar tracks the change in distance during a given period of time and determines the target’s speed. For example: if the target began 546 feet away and ended at 510 feet away and 0.3 second elapsed, lidar will calculate that the object traveled 36 feet in 0.3 seconds and convert that measurement to 81.8 miles per hour. All lidar devices used by law enforcement in Virginia must be approved by the Virginia Division of Purchase and Supply. There are approximately 19 different types of lidar units that are approved for speed enforcement. However, by far the most popular lidar units in Virginia are the Prol Lite + and the Pro Laser III (manufactured by Kustom Signals). Both devices are designed and required to measure speed within plus-or-minus one mph. The range of a lidar device is well over two thousand feet (more than one-third a mile). However, the functional range of a lidar device (without out a tripod) is limited by the infrared beam’s width relative to the target’s size, the reflectivity of the target, atmospheric conditions, the cleanliness and age of the lidar lens, whether the device is being directed through glass (e.g. the cruiser’s windshield), and the operator’s ability to hold the device steady. The width of lidar’s infrared beam is typically .003% of the target’s distance. For example: if a trooper measures a car that is 1,000 feet away, then the car will be struck by a beam that has a three-foot diameter. The greater the range, the bigger the beam diameter and the greater the difficulty of measuring just one target at a time. Most lidar devices in Virginia will not produce a valid measurement if a part of the beam is striking the intended target while the rest of the beam is striking an object behind the intended target. Lidar’s range is typically limited more by the operator than by the device. It is difficult for a law enforcement officer to continuously hold the beam on a moving vehicle that is further than nine hundred feet away. It is also difficult to identify a vehicle in daylight if it is further than eight hundred feet away. While it is possible to produce a speed measurement at these distances, it is difficult for officers to verify the accuracy of the measurement because the officer will have difficulty obtaining a valid tracking history. 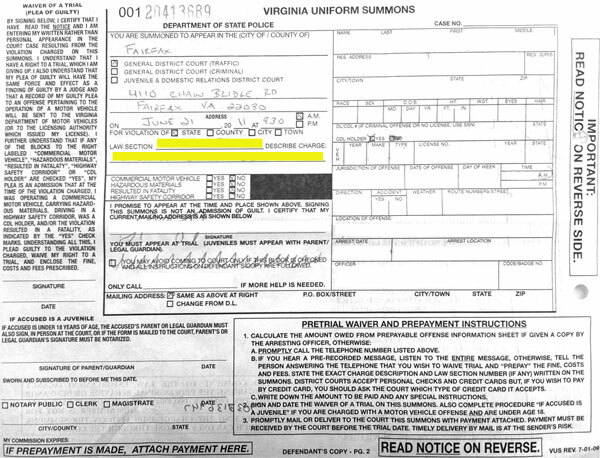 Because of this, several jurisdictions outside of Virginia have established rules against using lidar at one thousand feet or more. In order for lidar to measure speed accurately, a specific percentage of the infrared beams emitted from the device must reflect back to the device’s sensor. If the beam is not pointed at an object that is very reflective or if the object’s surface is angled (like the angles on a stealth fighter jet) then a smaller percentage of the beam will bounce back and it will either limit the range or take more time for the lidar device to obtain enough readings. Under ideal conditions it takes 0.3 seconds for the lidar device to produce a speed measurement but it takes longer as conditions worsen. If too few beams return then the device will not produce a result. Consequently, the police are trained to aim the infrared beam at the license plate or headlights because of their reflective qualities and perpendicular surfaces. Cars with hidden headlights and no front license plate are more difficult to measure beyond 700 feet (or more than 500 feet when operating the lidar through glass). Precipitation, fog, humidity and the condition of the lidar’s two lenses may also affect lidar’s range and effectiveness. Moving the lidar beam during the measurement process may artificially increase the speed reading. When a police officer’s hand moves during the measurement process, the lidar beam moves from one location to another. The difference in distance between the two locations may be read as if the device was measuring one moving object. This type of error is called “sweep error.” The further the operator is from the target the more likely sweep error is to occur. A common type of sweep error occurs when an officer directs the beam at a vehicle’s windshield and then lowers the beam to the front license plate in order to produce a stronger signal. The change in distance between the vehicle’s windshield and its front license plate may produce a five to nine mph increase in speed. This phenomenon can be observed by moving the lidar beam quickly from the windshield to the front license plate of a parked car. The stationary vehicle will produce a speed reading of five to nine mph. Without a tracking history a law enforcement officer cannot verify that there was no sweep error. 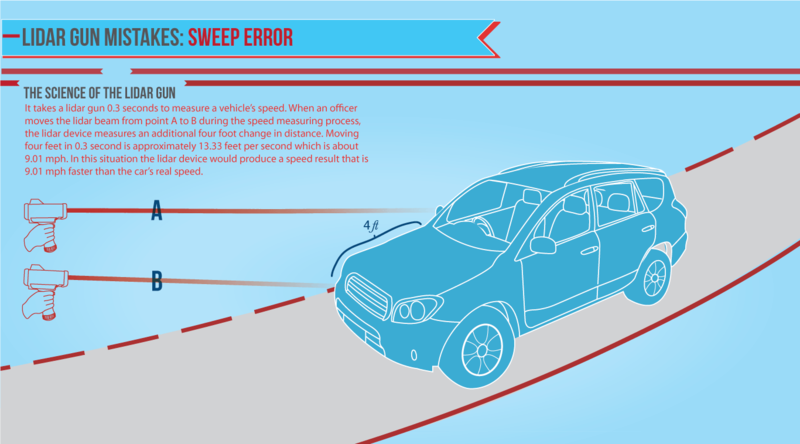 Sweep error is most common when an officer is only taking brief “snap shot” speed measurements instead of continuously tracking the vehicle’s speed for several seconds. Sweep error is also more likely at far distances when it is difficult to visually estimate speed and when slight movements in the officer’s hand can cause rapid changes in the beam’s location. Law enforcement officers aim lidar devices using a heads-up display (HUD) which contains a set of cross hairs and a digital screen that displays speed, distance, and approximate beam location. Magnifying the HUD makes it difficult to estimate the target vehicle’s speed at close range and thus makes it difficult to establish a tracking history. When a law enforcement officer measures a vehicle the HUD generates a red circle on top of the general location where the beam struck. This red circle and the cross hairs are the only indication of where the invisible infrared beam is striking. As with gun sites, HUD sites can become misaligned if dropped or mishandled. Misalignment may attribute the speed measurement to the wrong vehicle. To prevent site-alignment error, officers should perform a vertical and horizontal sight-alignment test at the beginning and end of each shift. Without these tests and a proper tracking history, an officer may not be able to guarantee the accuracy of his speeding citations. Every six months all lidar devices are required to be sent to the manufacture’s laboratory to be calibrated for accuracy. Additionally, at the beginning and end of each shift the officer should perform the following tests on their lidar device. The officer should run a “self-diagnosis” on the lidar device. This includes checking that LCD screen is functioning properly and that the self-diagnosis returns the appropriate results. It also includes measuring a known fixed distance with the lidar device and checking that the result is within plus-or-minus one foot. Additionally, the officer should perform a HUD alignment test. Proper calibration and testing is essential for reliable speed enforcement.